Congenital pulmonary vein stenosis is a rare entity caused due to failed incorporation of common right and/or left pulmonary vein into the left atrium. Below is a case report of a combination of predominantly left-sided pulmonary vein stenosis with right pulmonary artery branch stenosis. The patient was an adolescent boy with mild symptoms. Clinical examination revealed features of pulmonary artery hypertension. Echocardiography and computed tomography scan were done to confirm the disease. Congenital pulmonary vein stenosis occured due to failed incorporation of common right and/or left pulmonary vein into the left atrium. Peripheral pulmonary artery stenosis (PPAS) is often unrecognized in the adult population. Main Pulmonary artery branch or PPAS should be suspected when a continuous murmur is heard or Chest X-ray shows post stenotic dilatation or area of decreased vascularity. Below is a case report of a 13 year old boy who presented with a rare combination of congenital pulmonary vein stenosis along with congenital stenosis of right pulmonary artery. A 13-year-old male patient presented to cardiology outpatient department with a complaint of easy fatigability for last 2 years. It was associated with mild shortness of breath on exertion. The condition was slowly progressive. On examination, he had blood pressure of 100/70 mmHg, pulse rate of 78/min (regular), Grade III parasternal heave, and loud and palpable second heart sound in left second intercostal space. A systolic ejection murmur of Grade 3/6 intensity was audible in left second intercostal space. Another peculiar finding was a continuous murmur in the back and both axilla. Electrocardiogram and chest X-ray were consistent with right ventricular hypertrophy. 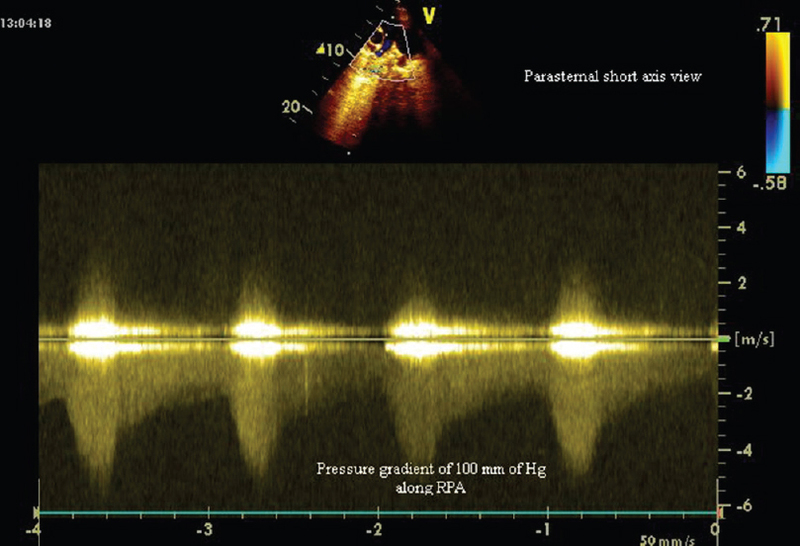 Echocardiography with color Doppler revealed moderate pulmonary artery hypertension (pulmonary artery systolic pressure of 55 mmHg (using Mahan's formula), turbulent, continuous, and high velocity flow consistent with severe stenosis of both left superior and inferior pulmonary vein and also right inferior pulmonary vein as viewed in modified parasternal short axis view [Figure 1]. A pressure gradient of 32 mmHg was documented at the insertion of right inferior pulmonary vein in left atrium in apical four-chamber view [Figure 2]. A stenosis of the right pulmonary artery was also detected distal to the bifurcation of main pulmonary artery [Figure 3]. A pressure gradient of approximately 100 mmHg was observed at the level of the right pulmonary artery in parasternal short axis view [Figure 4]. Computed tomography (CT) angiogram of thorax confirmed the stenosis of three pulmonary veins as well as branch stenosis of the right pulmonary artery. CT scan revealed dilated main pulmonary artery (diameter = 3.9 cm) and dilated left pulmonary artery (diameter = 2.7 cm). Right pulmonary artery (diameter of proximal part = 1.7 cm) had a focal narrowing in distal part (diameter = 0.49 cm). Narrowing was seen at junction of bilateral inferior and left superior pulmonary vein with left atrium. The diameter of the right inferior pulmonary vein was 2.2 mm, and left superior and inferior pulmonary vein was 3.9 mm each. 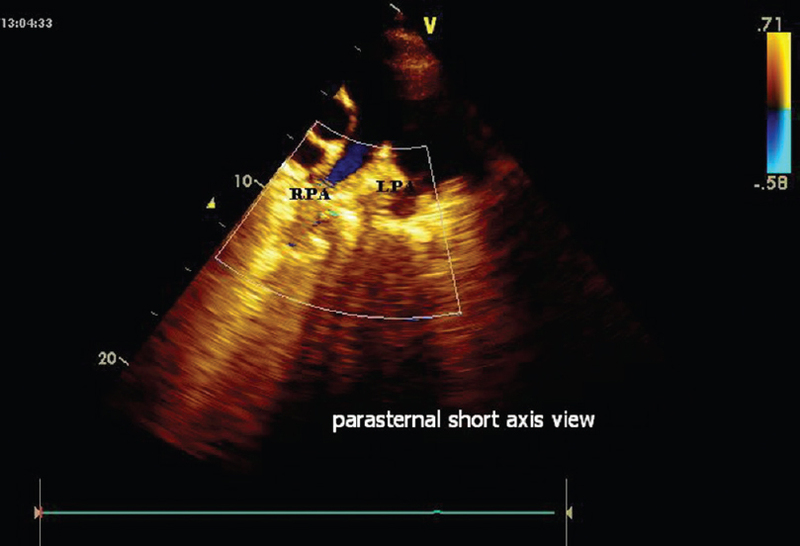 Figure 1: Turbulent flow detected at the insertion of left upper pulmonary vein and left lower pulmonary vein seen in modified parasternal short axis view. 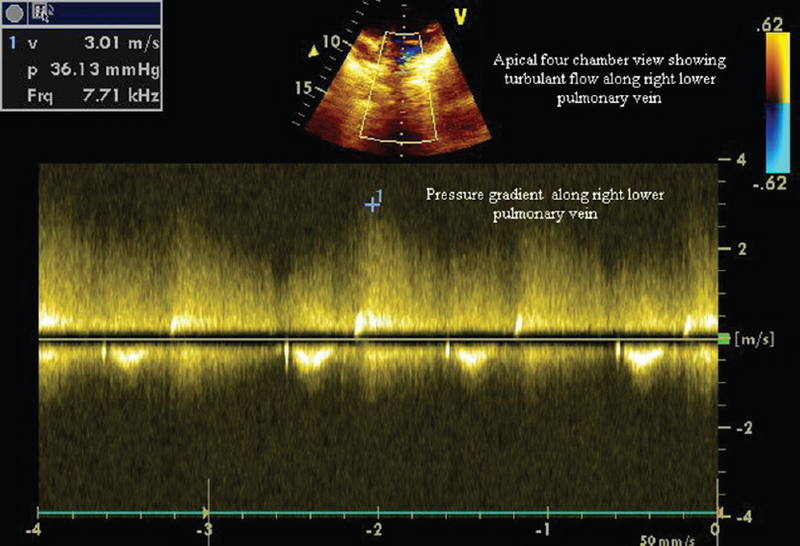 Figure 2: A pressure gradient detected at the level of insertion of right inferior pulmonary vein in apical four-chamber view. Figure 3: Stenosis is seen in distal part of right pulmonary artery. Figure 4: Pressure gradient at the level of right pulmonary artery in parasternal short axis view. Congenital pulmonary vein stenosis is an important but rare cause of pulmonary artery hypertension. It occurs due to failed incorporation of common right and/or left pulmonary vein into the left atrium. Usually, the condition is diagnosed in older infants and children, but it may be manifested as severe persistent pulmonary hypertension of the newborn. The most common cause of acquired pulmonary vein stenosis is post-radiofrequency ablation for treatment of atrial fibrillation. The condition is relentlessly progressive causing 50% death in 5 years even after successful surgery. Initial experience with cutting balloon angioplasty was successful as palliative procedure though longest interval before repeat intervention was only 6 months. Nowadays, surgical release of venous obstruction and pulmonary artery band ligation have been tried. PPAS can lead to pulmonary hypertension but is likely misdiagnosed as either idiopathic pulmonary arterial hypertension or chronic thromboembolic pulmonary hypertension. Therefore, a high index of suspicion during the initial evaluation of pulmonary hypertension is essential for its prompt diagnosis and adequate treatment. A combination of predominantly left-sided pulmonary vein stenosis (as both the left upper and lower pulmonary veins were involved) with right pulmonary artery branch stenosis is very rare, and in this particular patient, development of pulmonary artery hypertension was delayed because of restricted blood flow through right pulmonary artery. Latson LA, Prieto LR. Congenital and acquired pulmonary vein stenosis. Circulation 2007;115:103-8. Holcomb RG, Tyson RW, Ivy DD, Abman SH, Kinsella JP. Congenital pulmonary venous stenosis presenting as persistent pulmonary hypertension of the newborn. Pediatr Pulmonol 1999;28:301-6. Pazos-López P, García-Rodríguez C, Guitián-González A, Paredes-Galán E, Álvarez-Moure MÁ, Rodríguez-Álvarez M, et al. 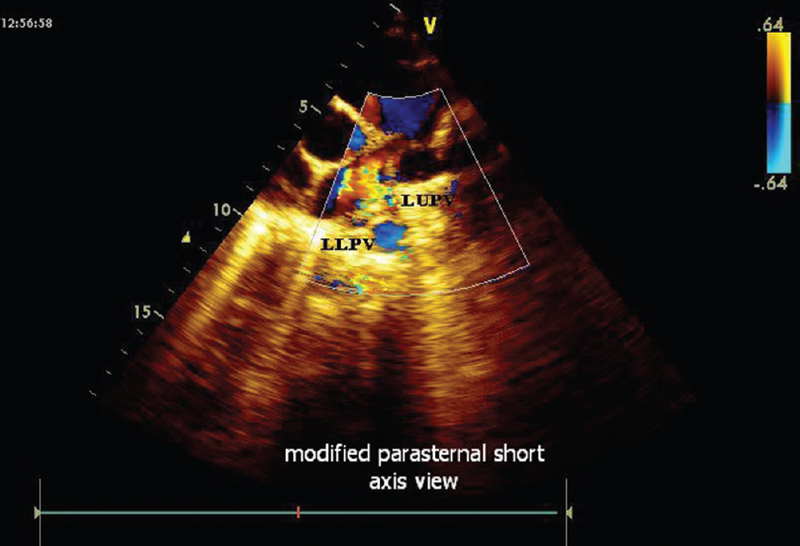 Pulmonary vein stenosis: Etiology, diagnosis and management. World J Cardiol 2016;8:81-8. Seale AN, Daubeney PE, Magee AG, Rigby ML. Pulmonary vein stenosis: Initial experience with cutting balloon angioplasty. Heart 2006;92:815-20. Ideno S, Yamamoto S, Oda F, Wakamiya R, Ozawa K, Kaneko H, et al. Management of pulmonary blood flow for a patient with congenital pulmonary vein stenosis undergoing pulmonary venous obstruction release and pulmonary artery banding. Masui 2015;64:168-73. Tonelli AR, Ahmed M, Hamed F, Prieto LR. Peripheral pulmonary artery stenosis as a cause of pulmonary hypertension in adults. Pulm Circ 2015;5:204-10.